I am thinking of decorating my Villa Fortuna dollhouse by Bodo Hennig--even though I still have not completed the Voila Large Dollhouse. The Villa Fortuna is a great modern dollhouse that would probably sell better in the U.S. if it was available at more retailers. 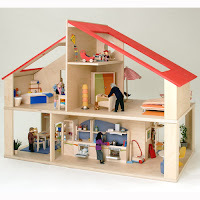 It is quality made of birch and Plexi and features customizable floorplans. It doesn't come with a staircase so you have to buy one of Hennig's staircase accessories. I recommend the spiral staircase, but the classic is fine too. I've said before that I like Hennig's Colora furniture sets, but this dollhouse becomes a whole new vision when more realistic modern furniture is utilized. I wish I could wave a magic wand and have this house set up, take my time decorating it and then wave that magic wand again to put the house away. There's definitely something to be said about laziness. Have you seen the Villa Fortuna with furniture on Amazon.com?